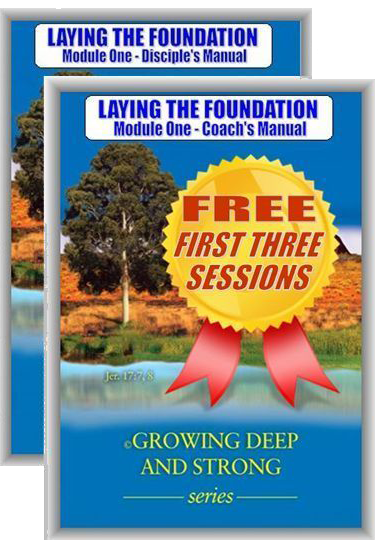 The co-authors of the Growing Deep and Strong series each have very unique gifts and experiences that work really well together. This has caused Growing Deep and Strong to be rich in content with a strong Biblical emphasis, yet very easily understood by new believers who have no church background. Carl was born in 1948 in rural Victoria, Australia and currently lives in Bairnsdale, Australia with his wife Karen. He grew up in a non-church background with no Biblical understanding of God. At the age of twenty, Carl made a decision that God and the church were irrelevant to his journey through life. In many ways his life was not unlike the prodigal son with very worldly living. In 1990 at the age of 42, married for the second time, Carl and his wife Karen experienced a total business failure and complete financial loss. During this time they were given a book called, This Present Darkness by Frank Peretti. From reading this book, Christianity made sense, and within 2-3 days God revealed Himself in a very real way to both Carl and Karen. The conversion to Christianity was a total commitment. However past baggage took them on a search for personal healing, cleansing, deliverance and a good discipleship course. Their personal growth experiences from 1990 onwards were wide and varied. Carl submitted his life to the Lord to bring healing to his past. He also was able to serve the Lord through his business skills and expertise in developing businesses. These are some of the areas of his involvement. Leading small groups for Marriage Ministries International. 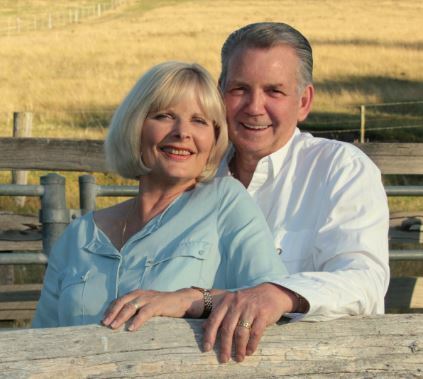 As National coordinators, successfully brought Cleansing Stream Ministries USA into the Australian church community. 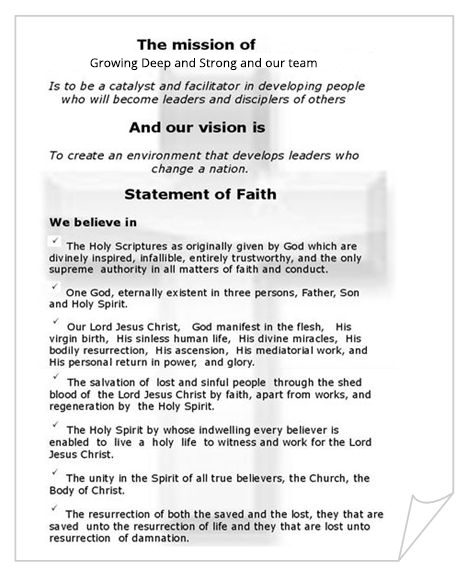 His company published and distributed Cleansing Stream Ministries materials in Australia and New Zealand. Led small groups in his local church. 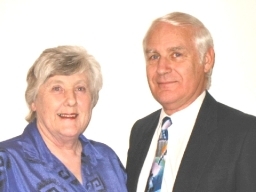 In 1999 Carl met David W. Searle in Tasmania while planting Cleansing Stream ministries in Tasmania. The friendship continued to grow and beginning 2001, Carl and David teamed up and began writing and producing the Growing Deep and Strong series. After seven years of extensive research, book design, graphics, trialling and development, the complete ©Growing Deep and Strong Series has now been released. David W. Searle’s rich Christian heritage and strong Biblical background, combined with Carl J. Fechner’s understanding of today’s worldview bring a unique balance to the material making it relevant and understandable to new converts by presenting the word of God simply. The material is written in a way that takes the new believer on a journey of personal discovery through the Bible that is relevant in today’s society, and applies God’s standards to the way life should be lived. Bachelor of Arts, Hons. Majoring in Biblical Hebrew and Biblical Archaeology, Melbourne University, 1973. Trained Secondary Teachers Certificate, Education Dept. Victoria, 1961. Diploma of Divinity, Melbourne Bible Institute, 1968. Licentiate of Theology, Melbourne College of Divinity, 1969. Graduate Certificate in Ministry, Counselling, Kingsley College Melbourne, 1996. Certificate in Business Management, Casey Institute of TAFE, Victoria, 1998. David has lived and worked in Australia teaching in secondary schools, lecturing in Biblical archaeology with the Australian Institute of Archaeology, Melbourne, and was the Curator of the Institute’s Museum. He has held various church pastoral and training positions including being on the Pastoral staff, Waverley Christian Fellowship, Melbourne for 11 years, and Senior Minister, Good News Fellowship, Upwey, Victoria for a further 6 years. While on the staff at WCF, Melbourne, he trained and mentored Small Group leaders and oversaw the development of Small Groups. He oversaw the initiation and development of the Mandarin speaking fellowship, and the development of overseas students’ ministry at WCFHe and Rosemarie trained teams for short-term overseas projects also. He trained leaders in the Leadership Training Bible College at WCF, Melbourne during his time there, and has lectured in the Key of Knowledge Seminars for church leaders in Australia and overseas for the past 20 years. He has also taught in Bible Colleges and churches in England, Europe, India, Malaysia, and Singapore. He has more recently been involved in leadership training and mentoring church leaders on a itinerant basis.